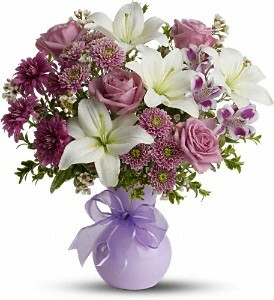 If you want to impress someone, send elegant flowers in a soft lavender vase accented with a lavender ribbon. Warm, rich, dramatic, it's the kind of gift that says, "You're special. And so am I." The stunning bouquet includes white Asiatic lilies, purple alstroemeria, white waxflower, lavender button spray chrysanthemums, purple cushion spray chrysanthemums and lavender roses accented with fresh greenery. 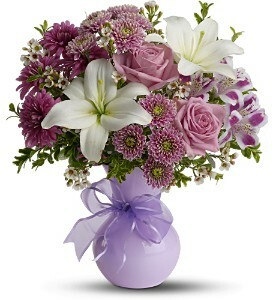 Delivered in soft lavender plastic vase tied with a lavender satin ribbon. Bouquet is approximately 14� W X 15 1/2� H.